Nothing is scarier for a homemaker than seeing her abode being infested and destroyed by pests. Oh, the horror of dealing with those tiny, ferocious creatures that lurk around the corners of the garden and slowly eating away the very foundations of your house! Blame it on the ever climate change or global warming, but the population of stinging insects like wasps has grown drastically over the years. Usually, they die off during winter, but now that there aren’t any freezing days, they thrive. The warm weather only boosts their survival chances- the colonies are bigger, hungrier and way more aggressive. There are several species of wasps other than the common yellow jacket ones you usually see around here. There are cicada killer wasps (ground digger wasps), paper wasps, gall wasp, black wasps, sand wasps, European wasps, and hornets. Each of these species has to be dealt with differently. Therefore, first, you need to identify the kind of wasp that has inhabited your garden. Wasps don’t usually create a menace unless you deliberately make any attempts to sabotage their nests. You can coexist with wasps only if you avoid visiting the place they’ve inhabited. Also, keep the yards clean and clutter free. Do not keep any food items in the garden, cover the trash cans and remove anything and everything that can potentially attract the wasps inside. If you cannot live with the wasp, then there are ways you can destroy or kill their colonies permanently. 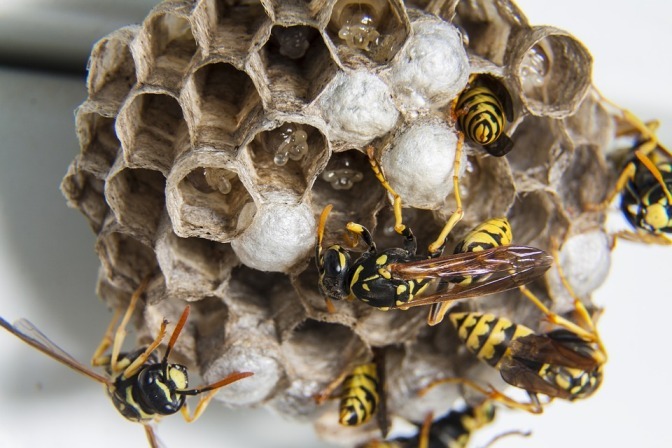 Knocking their nests down with a broom, spraying insecticides over it at night, relocating the nests to a safer location are just some of the ways you can get rid of the wasp nests. Peppermint oil works are an excellent repellent for all kinds of pests especially wasps. The remedy is most effectively utilized for destroying large wasp nests and wide stretches of gardens and yards. Peppermint extracts when in concentrated form (16 drops of peppermint oil in an ounce of water) drives out the wasps away almost immediately. You can also use cinnamon oil as an alternative, although it is stronger and can also cause rashes. Other essential oils of lavender, geranium, clove, and lemongrass, when mixed with mixed with soapy water or vinegar, make a more pleasant bug spray. The landscape of your yard or garden can also play a major role in attracting or repelling the wasps and other flying insects. There are certain plants and trees that are naturally repelling to stinging pests. Adding green foliage to the garden not only enhances its aesthetic appeal but also keeps away the pests from your house. Spearmint, thyme citronella, eucalyptus, and wormwood are some of the plants that serve as natural wasp deterrents. Trapping the wasps in their nests is one of the easiest and most effective ways of stopping the infestation from spreading out any further. To make the water trap, you’ll need to cut a 2-litre plastic bottle from the top and discard the screw cap. Fill the bottle halfway with water and coat the neck of the bottle with jam before you invert and push the top back inside the bottle opening. The wasps would go down the funnel to get to the jam but will be unable to find their way back up. Most of them would gradually fall into the water and drown. You can even add a few drops of soap to the water, the wasps die faster without suffering a lot. Note: the water trap must be cleaned or replaced every day as the decaying wasp corpses might form a footing for other wasps to help them escape. The glass trap is a sturdier, more effective alternative to the water trap discussed above. For starters, the entire setup is more solid. Secondly, the wasps have an even lesser chance of escape than they did in the previous home remedies. These traps come in a variety of vibrant colors (wasps are lured by bright shades), and designs. All you have to do is add some water (flavoured preferably, like lemonade), replace the stopper and then hang it in the area with high wasp concentration. The wasps fly in through the bottom hole and are trapped inside the glass structure, eventually drowning in the water. Wasps for all their threats are necessary for the environment. If you are among those who do not support the brutal killing and destruction of the wasp nests then you can try the alternative method of relocating them elsewhere. Relocating the wasp nests is a much milder but dangerous technique when compared to the others we have discussed above. You can relocate a small nest (paper wasp nests for example) using a plastic container and a lid. Also, carry a large cardboard box to cover the container. Approach the nest in the dark when the wasps are sleeping, place the container over their nest and cover it with plastic. Carry the nest to a safer location carefully without disturbing the inhabitants inside. Wasps are usually active during the warmer months of summer and spring. You can prevent these stingy creatures from infiltrating your home by setting up traps and fake nests. Wasps are very territorial creatures and live in colonies. If they find that the spots around your garden are already occupied, chances that they would nest somewhere else. They would definitely relocate when they discover a rival colony’s nest near theirs. You can build a fake nest using some of the junk lying around your house. Bundle up a couple of plastic bags inside a larger brown paper lunch bag and hang it around the ceiling using some string. A good way to kill all the wasps at one go would be to smoke them out. Light a fire in the grill below the nest, or build a small bonfire underneath it. The heat and smoke rising up would seep through the thin walls of the nest and permeate inside driving the wasps outside or suffocating them. 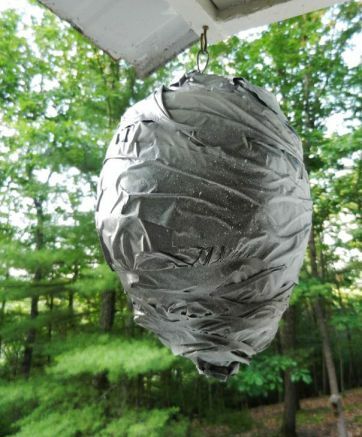 Allow the smoke to rise for an hour and two and then knock the nest down when you’re absolutely sure that all the wasps are dead inside. Keep a bottle of peppermint spray or soapy water nearby to ward off the wasps that manage to escape the burning nest. Note: the technique works only on Ariel nests that are hanging on tree branches or any other exposed area. Add a cup of sugar to a pot of water, boil the mixture and then pour it on the infested area. You can store the remainder of it in the fridge and use it later as well. The sugar water bait though repellent for wasps can attract other pests such as ants, bees, and hornets to your garden. Therefore, it is best that you add some apple cider vinegar to the concoction, add some jam/jelly and place it near the wasp nests. This combination is not as appealing to other flying insects. 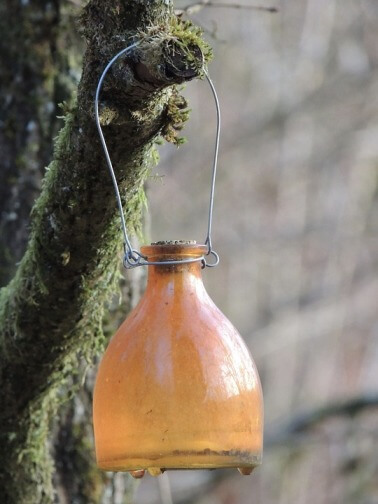 You can even use sweet-scented lavender soap, fruit juice, beer and cola as baits for luring wasps. If you are not into spraying poison all over your yard, then botanical insecticides are a better alternative. Citrus oil extracts, for instance, are pretty effective in driving the wasps away without harming your garden. It contains high amounts of limonene and linalool that immediately kills any wasp that comes in contact with it. Always keep a bottle of citrus oil handy when gardening, this way you can defend yourself against wasp stings. You can even add some peppermint oil to the mixture for more effective results. European wasps aka the yellow jackets are among the most commonly found and notorious of species that mostly inhabit homes and gardens. Most insecticides or bug sprays contain harmful chemicals and poisons that can destroy your garden soil. A safer and more eco-friendly alternative to this would be to directly pour boiling hot water over the nests. This isn’t exactly the most humane way of getting rid of the pests (they die a painful death) but it’s quick and hassle-free. It is best that you attack the nests at night when all the wasps are inside the nest sleeping, this way you can kill them all and also prevent any chances of getting stung. Natural insecticides are perhaps the easiest and most effective solution for people who want to get rid of wasp nests outside the house. 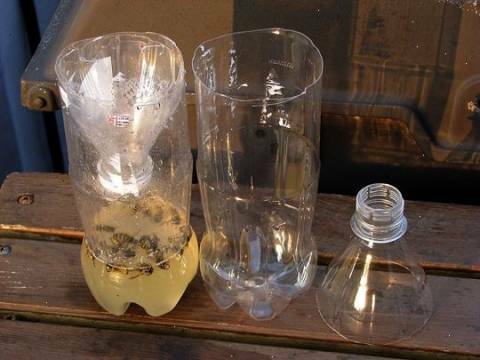 You can make your own wasp spray or get one from over the counter at any supermarket. Homemade sprays can be prepared by mixing equal proportions of white vinegar and water. Add a couple of drops of peppermint oil and some dish washing soap to the mixture. Pour the solution into a spray bottle and generously spray it in and around the nesting area. The wasps inside the nests are immediately killed off and the peppermint smell discourages other pests from nesting the area. Pests can be found anywhere and everywhere around the house, wasps nest in the attic. There are wasps around the pool, yard, wall, roof, under deck and almost every remote corner of the property. The best ways to get rid of the wasp nest it to completely destroy it and drive the wasps out. Of course, it involves some risk and you’ll have to be extremely cautious about it. Hot pepper or chillies are effective in keeping the wasps and other pests at bay. Mix 3-4 tablespoons of red hot chilli powder or freshly cut pepper with a gallon of water. Simmer the ingredients in a pan for about 15 minutes. Add a few drops of dishwashing soap to the mixture and let it sit for a while. After 25 minutes, pour the solution in a container and water the plants and trees in your garden with it. Apple Cider Vinegar is a common ingredient found in most kitchens that not only enhances the flavor of the dishes you cook but also has several medicinal properties. The solution is anti-bacterial and replete with citrus acid. Mix a few tablespoons of apple cider vinegar with lukewarm water, you can add some essential oils to the mixture as well. Pour half of this solution in a bottle with a shaker or a funnel-shaped top. For the other half, you can add chopped apple pieces. It reduces pressure building inside the container and also prevents the loud buzzing noise when the pests try to escape. Spray generous amounts of the mixture on the nesting areas and then scrub the place with soap after a while. Another effective wasp control method is to use some powdered deterrents like talcum powder, boric acid, cinnamon or diatomaceous earth to kill them. You can easily find these ingredients in your house or at a convenience store. 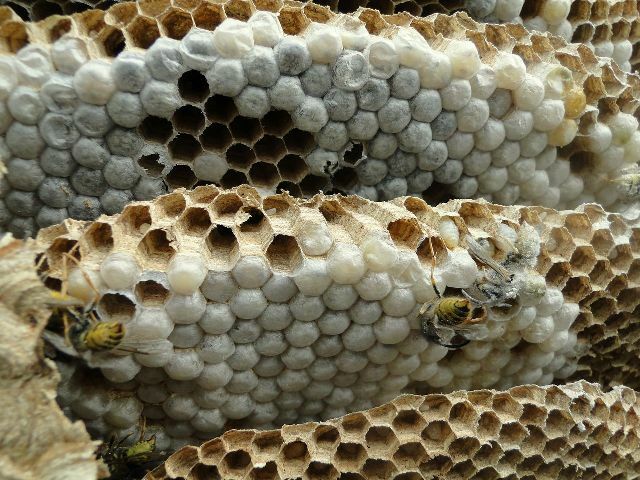 Sprinkling some DE (diatomaceous earth) can be quite fatal for the wasp colonies as they contain eugenol that dries out the wax coating their bodies. Talcum powder and cinnamon, on the other hand, are repellents and only manage to drive the wasps away from their nests. These powdered deterrents can reach even the remote corners and crevices of your property and are among the most effective wasp nest removal methods on our list. Once the insects escape or are killed, seal the entrance of the nest with peppermint oil to prevent any future chances of infestation. Avoid swatting or squashing the wasps, when a wasp has squashed it releases a pheromone that incites other wasps. Don’t apply any strong perfume or scent when you’re dealing with a wasp problem in the garden. Don’t panic simply stay away from them, the wasps don’t really sting you unless provoked or agitated. Unwanted pesky critters not only ruin the aesthetic appeal of the house but also pose a threat to its inhabitants. Now, there are many companies that manufacture wasp repellent sprays and solutions that help eliminate these creatures. However, these products contain harmful chemicals that also harm the environment. It is best that you make use of the products lying around the house and create your own remedies to eradicate wasps. 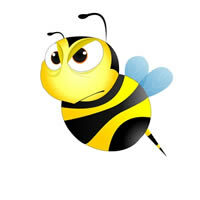 Complete guide on best way to get rid of bees naturally from your home, lawn and surrounding area, identifying bees, amazing facts, types of bees, and professional bee removal cost. Subscribe for getting fresh news in your mail box. Bees In Winter – Do Bees Hibernate? © 2019 How to get rid of bees | All rights reserved.